'The Battle of the Centaurs'. That a teenager, Michelangelo was seventeen when he produced this work, could execute such a sophisticated piece of sculpture is remarkable. The Battle of the Centaurs is a writhing mass of figures three-dimensionally carved into a marble block. The figures are layered in overlapping positions adding to the spatial depth of the work. We can see the artists interest in the massive bulk of the naked male form, a theme that would serve Michelangelo well in future commissions, including his work in the Sistine Chapel. to make sense of the intertwining human narrative emerging from the stone. 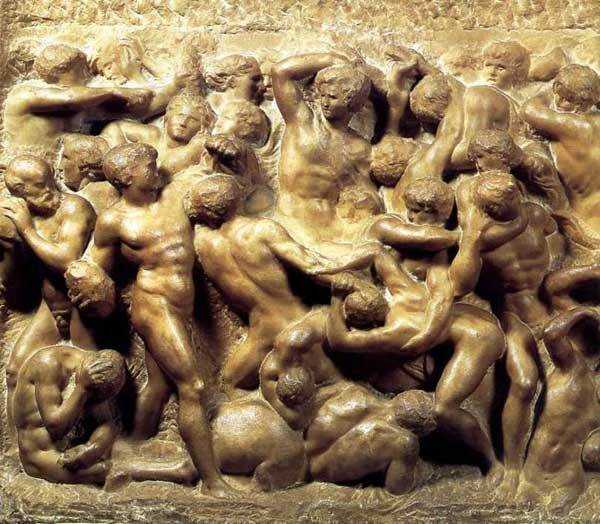 'The Battle of the Centaurs', 1492 Marble Relief, 33x35 inches . This is probably a demonstration piece showcasing the skill of the artist. The block stands alone and does not appear to be connected to any great work and in fact, we have no knowledge of any intended destination for the sculpture. Michelangelo would have been aware of earlier relief works by Donatello and the stone reliefs of antiquity but this was a work that had no fifteenth-century comparison. If this is a practice piece of sculpture by Michelangelo he is certainly showing what he can do. In its rough state it seems to show the artists method of construction and the transition from marble block to a complex array of humanity. The title is misleading, it is difficult to distinguish any centaur-like creature within the composition. However, the central lower figure does seem to have the rear of a horse by its side. The imaginative process that has produced this work, alive with dynamism and movement, is awe-inspiring, a true masterpiece. Is this image a man being crushed by a dying horse or the mythical half-man half-horse centaur?